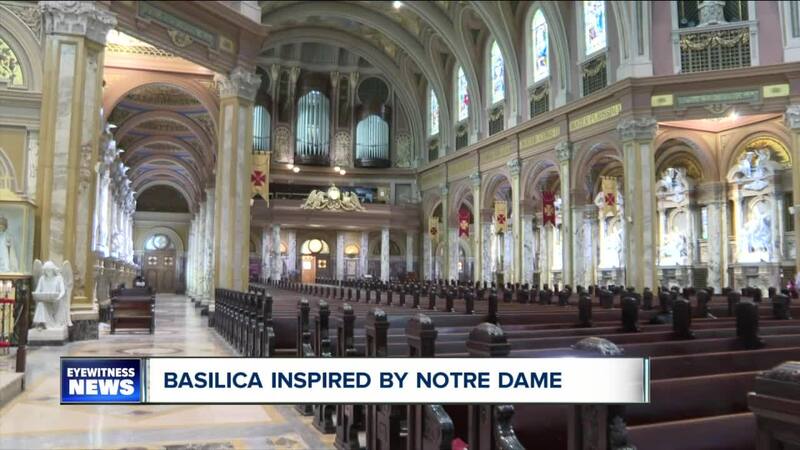 LACKAWANNA, N.Y. (WKBW) — David Kersten, the CEO of Our Lady of Victory Homes of Charity, stands in Our Lady of Victory National Shrine and Basilica in Lackawanna. He thinks about the fire that tore through Notre Dame in Paris. Two years ago, during Holy Week, Kersten was in Notre Dame. “You know it's going to take a long time to sort this out. Hopefully, they can preserve many of the things that were damaged,” said Kersten. For Kersten, and the rest of OLV, Notre Dame is extra special. While the Basilica isn't a copy of Notre Dame, it was designed to provide a similar feel. “It's meant to inspire and to lift people's hearts and minds upward to heaven and recognize that this earthly life is but a stepping stone to be with our ultimate reward, to be with God in heaven,” said Kersten. The Basilica was finished in 1925. It cost $4 million. It was built after the St. Patrick's Parish burned in 1916. Father Nelson Baker wanted to build a church that rivaled those in Europe. “Father Baker himself was inspired by a visit to Paris,” said Kersten. This grand Western New York shrine rose from the ashes. Now, its caretakers, know Notre Dame will rise again.